Can New Technology Stop Drowsy Driving Accidents? Drowsy driving is all too common on U.S. highways. 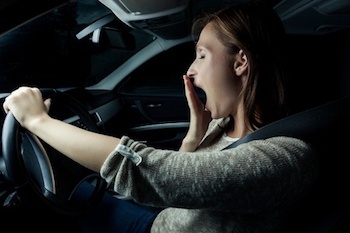 The National Highway Traffic Safety Administration reported that 824 people were killed in car accidents in 2015 that were caused by drowsy drivers. This condition is so prevalent and dangerous that there is even a special name for the feeling of falling asleep while driving. It's called a microsleep, describing the sensation of drowsy unconsciousness into which you can slip even with your eyes open. But drowsy driving is more than just getting sleepy at the wheel. Microsleep affects drivers with an impairment similar to driving under the influence of alcohol. The driver's reaction times are slower and both judgment and mental processing are compromised. The best way to fix drowsy driving is for the driver to pull off the road in a safe area and take a nap. But are there other solutions for this deadly problem? No it's not science fiction - in the future, cars may "talk" to each other in order to take evasive maneuvers away from a drowsy driver! Bosch is working on a camera-based system that will monitor head and eye movements and other body indicators like heart rate, posture and temperature. Future cars with autonomous driving will be able to pull to the side of the road or stop if driver drowsiness is detected. Seat sensors created by Plessey will monitor the driver's heart rate and breathing and will produce a warning when these body signals indicate a pattern typical of someone who is falling asleep. Valeo's infrared camera system will monitor the driver's head, shoulder and neck movements for signs of sleepiness. Volvo's innovative approach includes directing the driver to the nearest coffee shop when erratic steering and lane departures indicate a sleepy driver. An artificial intelligence tool undergoing experiments by Nvidia will first "learn" a driver's behaviors and then be able to detect when the driving patterns are outside the norm. The system uses head position, posture and even blink rate to detect drowsiness and issue a warning. The car may even take the driver to a safe spot to rest. If you or a family member has been injured in a car accident or has been injured by any other type of personal injury, please contact the Law Offices of Diana Santa Maria, P.A. immediately. Our experienced attorneys will fight for the compensation you deserve. Please call us for a free consultation. Attorneys Diana Santa Maria and Laura D. Dolin, personal injury attorneys in Fort Lauderdale, will fight to secure justice for you and your family. You can reach us at (954) 434-1077 or contact us via the website.